Hadgie Sue (Lummus) Merritt is the third of the four children born to the late Andrew Jackson and Laura Francis (Warren) Lummus, and the sister of 1st Lt. Jack Lummus, in whose name she--together with Thelma Lee (Lummus) Wright--will christen the fourth and newest Maritime Prepositioning Ship on February 22, 1986. 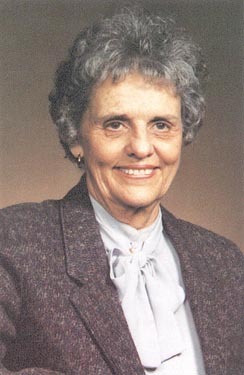 Sue was born in Ellis County, Texas, and reared in Alma and Ennis. She graduated Ennis High School. She was employed in the banking industry in both Dallas and Ft. Worth, Texas. On May 21, 1936 Sue married Dorsey Thomas Merritt of Los Angeles, California, formally of Ennis. She gave birth to a daughter, Randee, and a son, John. Tommy served in the U.S. Army Air Force during World War II. Note: General Dynamics Corporation hosted the Christening Ceremony of the 1ST LT JACK LUMMUS on February 21-22, 1986 at their Quincy Shipbuilding Division in Quincy, Massachusetts.